Early-morning practices and evening games in the fall and early spring can get pretty chilly. Your athletes will struggle if you ignore the effects of cold weather. You know what it’s like trying to perform your best in cold conditions. Bone-chilling temperatures are uncomfortable, even for the toughest athletes. Breathing in cold air requires more energy, which can make it difficult for athletes to stay active and focused during practices and games. Your team will struggle in cold weather if it lacks the proper athletic gear. Your team's players aren't the only ones who suffer on frosty mornings. You and your coaching staff have to man the sidelines without the benefit of athletic activity to keep warm. Add in some rain or wind and it can get pretty miserable. In extreme cases, cold weather team practices expose players and coaches to some pretty serious health risks. Frostbite, for example, occurs when skin is exposed to extremely cold temperatures for extended periods of time. A person's ears, feet, nose, and hands will start to feel numb if he or she experiences frostbite; it can also cause blistering and hardening of the skin. Teams that must practice outside in these conditions generally choose technical team training gear specifically constructed to protect athletes, like wind-resistant clothing, gloves, and hats. 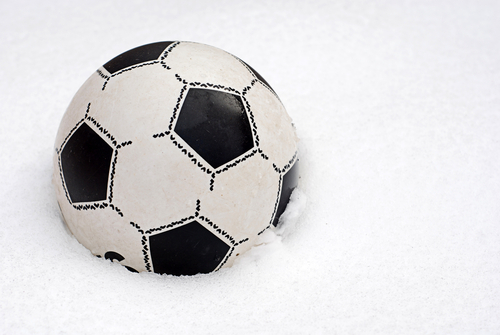 More commonly, however, most teams simply choose to stick to the gym in sub-zero weather. That’s one of the reasons that indoor sports like basketball and volleyball are traditionally played in the winter. Football teams whose seasons stretch into December and softball teams who begin outdoor practices in early March are more worried about how cold weather can change their performance than the health risks. Experience tells us that baseballs are harder and joints are stiffer in the cold weather. What does science say? Research indicates that athletes burn carbohydrates at a higher rate in colder weather, draining their energy reserves faster. “Explosive power” is also limited, due to colder muscles. (We found a good overview of the scientific research on athletic performance in the cold here.) In addition, while you probably associate water loss with hot, muggy conditions, this problem can affect athletes and coaches in cold weather as well. You can quickly lose respiratory fluid through breathing, and since you're often wearing multiple layers of clothing in cold temperatures, you become less likely to notice when you're dehydrated. Sweat instantly evaporates in cold, dry air, and your body does not elicit the same response to dehydration as it normally would in hot temperatures. That’s why it’s important to choose team training gear that manages moisture even in cold temperatures. Take extra precautions in cold weather. Layering is vital for athletes and coaches to stay warm and perform well. Covering the ears, feet, nose, hands and mouth can also help your squad remain comfortable outdoors, regardless of the temperatures. Athletes and coaches will benefit from cold weather compression shirts and pants. Your team can stay warm, dry, and light with clothing that is specifically designed for frigid temperatures. If you need help choosing the right gear and apparel to improve your team’s performance in the cold, download our free resource, "The Team Buyer's Guide to Choosing Uniforms, Apparel, and Gear for Performance and Durability,” by clicking on the image below.